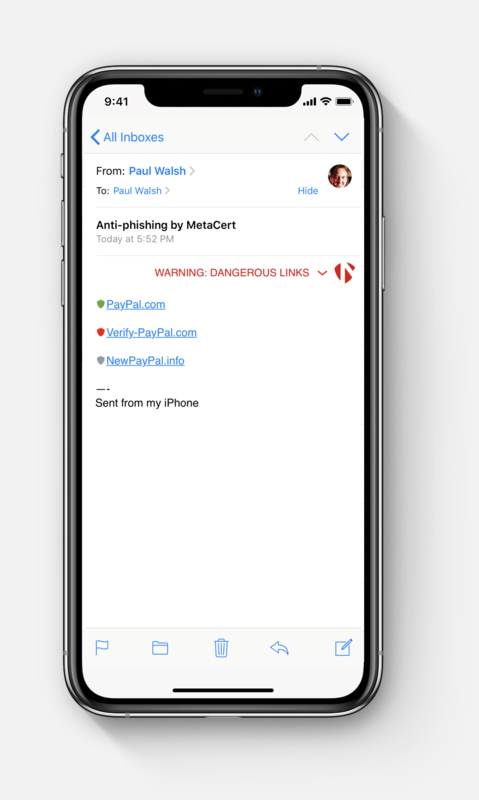 MetaCert, founded by Paul Walsh, originally began as a way to watch chat rooms for fake Ethereum scams. Walsh, who was an early experimenter in cryptocurrencies, grew frustrated when he saw hackers dumping fake links into chat rooms, resulting in users regularly losing cash to scammers. Now Walsh has expanded his software to email. A new product built for email, available here, will show little green or red shields next to links, confirming that a link is what it appears to be. A fake link would appear red while a real PayPal link, say, would appear green. 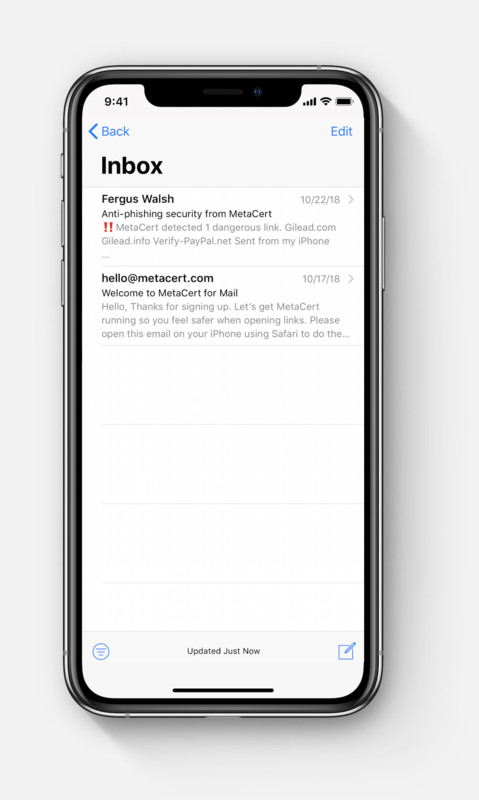 The plugin works with Apple’s Mail app on the iPhone. Walsh is also working on a system to scan for Fake News in the wild using a similar technology to his anti-phishing solution. The company is raising currently and is working on a utility token. Walsh sees his first customers as enterprise and expects IT shops to implement the software to show employees which links are allowed, i.e. company or partner links, and which ones are bad. 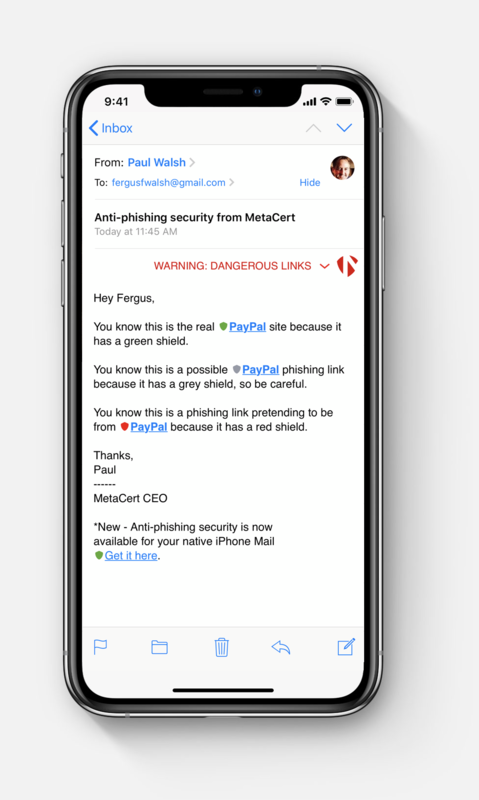 “With MetaCert’s security, training is reduced to a single sentence ‘if it doesn’t have a green shield, assume it’s not safe,’ ” said Walsh. In the long, obtuse history of Things That Became Memes, there are some obvious ones—Nyan Cat, say, or maybe Doge—and some less obvious ones. (Did anyone see “covfefe” coming?) Today’s entry falls squarely in the latter category. In the last few days, as the European Union has been ramping up to roll out the European General Data Protection Regulation—referred to affectionately by the acronym GDPR—folks online have been both reeling and ready. Reeling from the scads of messages they’ve been receiving about changes to how companies that operate in the EU handle their data, and ready with snarky reactions to the rollout. The internet being the internet, most folks responded to those messages and outages with humor and/or outsized outrage. It is, obviously, only fitting that this would happen. For a place that evolves rapidly, the internet seems to love the status quo, and any changes to it do not go unnoticed. And honestly, considering the often horrific firehose of information and dialogue that often spews out of the internet, a little ribbing at the expense of the EU and their robust and thoughtful data privacy policies seems almost quaint. Did YouTube phenomenon Poppy steal her style from another star? Just when you thought the rickrolling meme might finally be dead, a Google bug has unwittingly allowed the R&B croonings of Rick Astley to migrate from your computer screen to your television. Shortly after the close of this year’s International Women’s Day, China’s Twitter-like service Sina Weibo shut down Feminist Voices. With 180,000 followers, the group’s social media account was one of the most important advocacy channels for spreading information about women’s issues in China, but in an instant, it was gone. A few hours later, the private messaging app WeChat also shuttered an account for the group. The official reasons for the closures were vague, simply that the accounts had posted content that violated regulations, but the subtext was clear: the country’s highly-monitored media was trying to silence women’s advocates. Masked women hold a symbolic funeral for the death of Feminist Voices. The ban of Feminist Voices, which was founded in 2009 and had operated on Weibo since 2010, is just the latest attempt by the Chinese government—and the media companies that operate under it—to curtail the growing women’s movement, which has flourished in urban areas and on university campuses thanks to social media and online organizing. "The movement has the potential to become large-scale, which is one of the reasons why the government sees this group of young feminists as a threat to Communist rule," Fincher says. But through its size and some symbological ingenuity, the young, active community has found a way to stay one step ahead of would-be censors. Take, for example, Chinese feminists’ embracing of #MeToo. The movement, which sought to show the volume of sexual misconduct against women by sharing stories of harassment and assault accompanied by the hashtag, came to prominence in China after a former doctoral student named Luo Xixi shared a letter on Weibo about being sexually harassed by a former professor. The story quickly went viral, sparking a huge debate about sexual misconduct and leading Weibo to block the #MeToo hashtag. But Chinese feminists found a way around it—they began using #RiceBunny in its place along with the rice bowl and bunny face emoji. When spoken aloud the words for “rice bunny” are pronounced “mi tu,” a homophone that cleverly evades detection. The use of emoji and memes as political tools or rallying points for movements is nothing new. Twitter users have added the paper-clip emoji to their handles to signify unity with people harassed for how they identify; the so-called alt-right has found myriad ways to troll and organize using symbols and memes. But those actions are more a matter of groups or movements using an online shorthand to convey a message; the Chinese feminists are doing the same, but their methods also help them dodge government censorship—or at least avoid being silenced for as long as they can. How long that is changes from one case to the next. Over the last few years internet users in China have been using Winnie the Pooh memes to criticize President Xi Jinping. After images appeared online comparing the leader’s portly figure to Pooh, references to the character were blocked on social media. The meme resurfaced after China’s legislature re-appointed Xi to power with no term limits. But instead of words, this time critics of Xi posted GIFs and images of the cartoon bear dressed in royal regalia on Weibo and WeChat. Soon, those were deleted too. And internet censors aren’t the only thing quelling speech. Activists in China also have to contend with the nationalist trolls known collectively as the 50 Cent Army. The term originally referred to internet users who were paid a menial wage by the government to spread pro-government propaganda online, but today “50 Cent Army” is used to loosely describe anyone online who vehemently supports the government. Xiao Meili, a prominent women's rights activist says she’s seen an increase in anti-feminist harassment online from 50 Centers since the Feminist Voices account was deleted earlier this month. While the growth of China's #MeToo movement online depends on its ability to navigate censorship, it faces challenges offline as well. "There are a lot of hurdles for it to expand on a large scale like what we’ve seen in America," Zeng says. “It’s important to consider the cultural context for #MeToo in China as gender relations are very different from the West and the regional disparity is huge.” The movement, she explains, currently remains an urban phenomenon and has yet to reach rural areas or receive vocal support from women working in industries like manufacturing. What does “self-care” mean amid the barrage of news and social media? Facebook just expanded the “Like” button with a feature it calls Reactions—six animated emoji the company hopes will let users to respond with more emotional nuance to the posts in their news feeds.